Like much of the young pitching the Cincinnati Reds have featured this year, Tyler MahleÃ¢â‚¬â„¢s season has been filled with ups and downs. HeÃ¢â‚¬â„¢s sporting an xFIP of 4.16 through 75 innings pitched in 2018, and while thatÃ¢â‚¬â„¢s not an awful number, itÃ¢â‚¬â„¢s below average. HeÃ¢â‚¬â„¢s also walking more guys than the MLB average (3.36 BB/9) and isnÃ¢â‚¬â„¢t wowing anyone with his strikeout numbers (8.16 K/9, solidly league average). 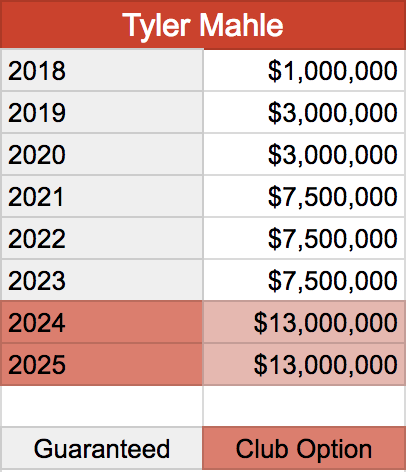 Despite all of this, and partially because of it, IÃ¢â‚¬â„¢m going to make the argument today that the Reds should lock up Tyler Mahle to a long term contract this season. WeÃ¢â‚¬â„¢ve seen what Mahle can do when heÃ¢â‚¬â„¢s Ã¢â‚¬Å“onÃ¢â‚¬Â. Having cruised through the minor leagues with some very impressive statistics, Mahle got to the majors last season and impressed. His shiny 2.70 ERA looked a little worse when you started looking at the advanced statistics (his 134 FIP- was the biggest eye sore), but it was clear that with a little more seasoning, Mahle would be a Ã¢â‚¬Å“guyÃ¢â‚¬Â at the major league level for years to come. 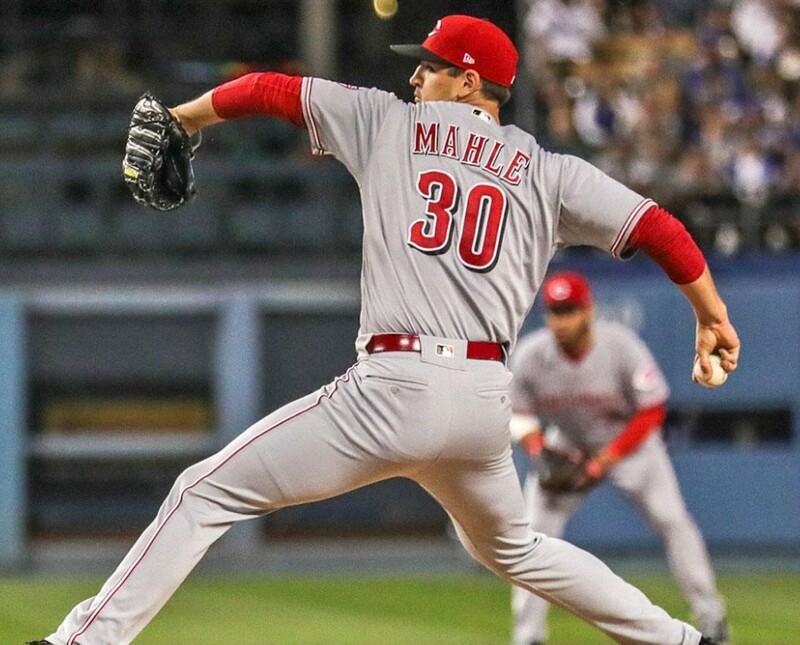 Figuring to probably start the season in AAA, Mahle came out of camp in 2018 impressing the Reds brass, enough to earn a starting role from the jump. He came out of the gates strong, pitching 6 innings of shutout baseball against the Chicago Cubs on April 2nd, but struggled in his next outing against the Pirates, giving up 5 earned runs in only 4.2 innings. These two games are a good microcosm of MahleÃ¢â‚¬â„¢s season; there are multiple instances of a great game bookended by two outings merely average or worse. He gave up 4 earned runs in three straight games against the Giants, Cubs and Rockies in May, before finally turning it on and impressing over his last few starts. WednesdayÃ¢â‚¬â„¢s game against the Royals was a typical Mahle gem, holding the Royals offense scoreless through 6.1 innings. ItÃ¢â‚¬â„¢s outings like this that we as fans look forward to from Mahle. We know heÃ¢â‚¬â„¢s capable of performing at this level, but like the rest of the young Reds pitching, itÃ¢â‚¬â„¢s consistency weÃ¢â‚¬â„¢re looking for now. ItÃ¢â‚¬â„¢s safe to say that if Mahle does find consistency, heÃ¢â‚¬â„¢d be a very valuable asset for a rebuilding team. His minor league track record, where he owns a nice 2.85 ERA over 5 seasons, shows that consistency might be a little more attainable for Mahle than it might be for some of the other young pitchers seeking the same thing. So letÃ¢â‚¬â„¢s say the Reds crunch the numbers, conduct a personality test, or whatever else they might do to determine that Tyler Mahle is a good bet to be a consistently good pitcher at the major league level. Locking up young pitching hasnÃ¢â‚¬â„¢t been nearly as prevalent as signing hitters to early-career extensions has been, mostly because of the injury risk. No matter how good you are, or how good of a head youÃ¢â‚¬â„¢ve got on your shoulders, or how consistently you hit the strike zone with your fastball, an arm injury is always just one pitch away. However, there are a few notable contracts for young pitchers signing extensions early on in their careers. WeÃ¢â‚¬â„¢ll take a look at two of them below, and then figure out where MahleÃ¢â‚¬â„¢s theoretical extension fits in with them. In 2011, the Rays signed Matt Moore to a 5 year, $14MM extension after only 17 days of service time and 19 innings pitched in the big leagues. Those 19 innings were pretty impressive though, and 10 of them were strong playoff innings in the ALDS. Moore had a solid, if injury-prone, career with the Rays before ultimately being traded to the Giants in 2016. Although the injuries sapped some of the upside the Rays were hoping to get in the deal, the money given up in the deal was miniscule. Considering the 2.7 fWAR Moore put up in 2012 alone, the deal was worth it for the Rays. The deal at the time was absolutely unprecedented for pitchers with little service time. It came only a few months after the unprecedented deal the Rays struck with Evan Longoria, and looking back at it now, both deals were great for the Rays. As a small-market team in the same vein, the Reds must look to make deals like this in order to be successful over long periods of time. Surprise, surprise: another contract from the Rays featured in this series. In 2014, the Rays signed stud pitcher Chris Archer to a six-year, $25.5MM extension after 156 days of service time. This contract is brought up almost every year, by every fanbase, as a contract theyÃ¢â‚¬â„¢d love to see their team trade for. Over parts of 7 seasons with the Rays, Archer has never had a below-average xFIP, has thrown 200 innings three times (and had a 194 inning season on top of that), and is generally an all around good dude. HeÃ¢â‚¬â„¢s the kind of pitcher any organization would love to have at the top of their rotation, and is doing it on the cheap for the Rays. No wonder we talk about them in these articles so much! If we all agree with the common thought that 1 WAR is worth roughly $6MM, the Rays got their moneyÃ¢â‚¬â„¢s worth out of Chris Archer back in 2014. His 5+ WAR 2015 was merely icing on the cake. Again, the Rays rolled the dice and it paid off. So, looking at these two players and the contracts that go along with them, what is Tyler Mahle worth? At the time of MooreÃ¢â‚¬â„¢s signing, he had just come off a season in which he pitched 9 innings of excellent regular season baseball, and 10 innings in the ALDS. He was widely regarded as a top prospect, and the fact that he was even extended at all was shocking to the baseball world. 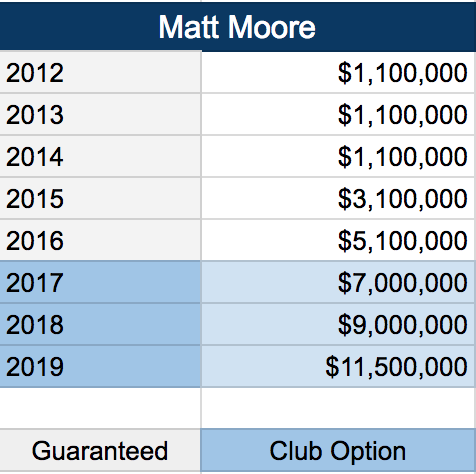 Archer obviously got more money in his deal, probably because the Moore deal set the market, and was generally considered a successful deal by the time 2014 rolled around. Archer was heading into his second full season in the big leagues, having just pitched 128 innings of 99 xFIP- baseball. He was almost as league average as you can get, which is extremely valuable at only 24 years old. Tyler Mahle is 23, and is currently sporting a 105 xFIP- Ã¢â‚¬â€œÃ‚Â pretty close to ArcherÃ¢â‚¬â„¢s mark the season before he got his extension. The two paths are pretty similar, with Archer having the slight edge statistically. Archer was also the better prospect, although not by much, never breaking Baseball AmericaÃ¢â‚¬â„¢s top 25 list. Both pitchers routinely placed in the top 100, though. The Reds have expressed the importance of having multiple years of the same value in a contract in the past, and itÃ¢â‚¬â„¢s evident in the Eugenio Suarez deal. Here they get Mahle leveled off at $7.5MM for his three arbitration years, before heading into two club options covering the first two years of free agency. It wonÃ¢â‚¬â„¢t break the bank for the Reds, while also providing Mahle with the security of a long contract at the beginning of his career. So, what do you think? 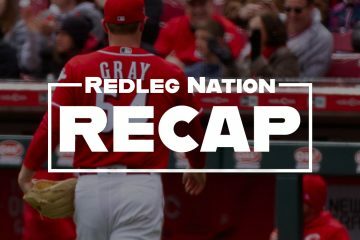 Is Tyler Mahle the Reds pitcher we should be talking about extending? Should we be talking about extending a pitcher at all? Let me know what you think in the comments. These types of contracts are a huge risk. You know you have the player locked in for six years to league minimum and whatever arbitration raises come. The costs remain minimal for these six years no matter how they perform. The first years at league minimum and the following years are tied to how they perform. The contract provides the player with stability, but may cause them to miss out on huge dollars in free agency if they are stars. From the team perspective a guy could end up like Mesoraco and Bailey always injured so instead of paying league minimum for an injured guy you are paying 10 million. Everything you said is true. But if Mahle is even an average starter for two and a half of these seasons, it’ll be financially paid off. Offering the contract seems like a pretty good idea; of course, the Reds won’t do it. Mahle is still young, and has a hard nosed attitude and a good work ethic. I think his biggest problem is actually……velocity. He knows when he has good velocity. When his fastball is a little off, he tries to be too fine with his control, and then problems. His AA no-hitter fastball velocity was ~ 97 mph. At 90 or 91 mph, he struggles and gets hit. Somewhere in between would be a good target. His fast ball velocity may stabilize as he gets a little older and stronger. Or sometimes with pitchers, this is as good as it gets. Maybe develop his change-up more, or another off-speed pitch. Good math and good post overall. 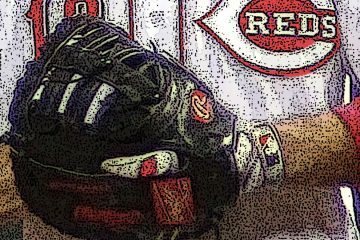 – $8 million per WAR is a commonly accepted measurement, which Mahle’s agent would certainly point out to the Reds, in hopes of bumping up the numbers. -2,000 innings pitched is sort of a mark where pitchers start breaking down and declining. Kershaw is currently at 1,984 IP and has been a mess physically of late. From the Mahle side, would need more in every year starting in 2019 and…. An assurance that he does not get sent down this season and a full year of service time is clocked. And, those 2024-25 seasons, Mahle’s FA years…definitely higher than $13M. From the Reds side, if you can get Mahle signed through 2025, at close to what is suggested, do it. 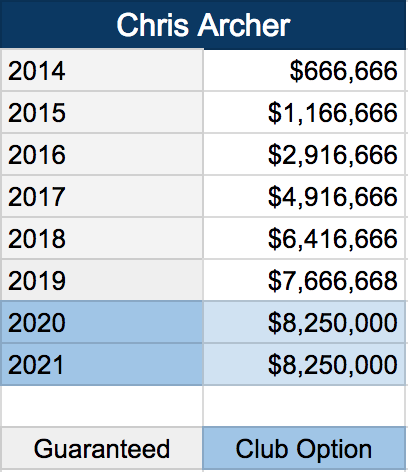 WAR in 2021 thru 2023 could easily be $10M per, and you could end up with an Archer deal, getting a 3 or 4 WAR pitcher in those years for the cost of 1 WAR. And, you are locking up the majority and best part of Mahle’s 2000 IP (assuming he gets them) and 2 of his FA years, most for under assumed future market value. The wild card in all this is what the new MLB CBA looks like, starting in 2022. Will teams want to extend someone several years into it, without knowing now what the parameters are then? First of all, I LOVE these posts, Jordan. Even on the ones where I don’t fully agree, it’s great to read about possible comparisons and it encourages a more in-depth understanding of MLB contracts. I hope you’ll do one on Anthony DeSclafani, I think he’s a prime candidate to sign right now at a slight discount because of his injury history. I’d also suggest, if you have the time and run out of future contracts, to take a look at a few of these extensions the Reds have signed in the past (Mesoraco, Cueto, Bruce, come to mind) and discuss what led the Reds to do them. They fall in a different category than the Phillips and Bailey contracts because those were exclusively about buying free agent years. And the Votto contract is, of course, the most interesting of all. It might also be interesting to see a couple examples of extensions the Reds should have considered and didn’t do – players who went on to have a couple valuable years after they left the Reds. On Mahle, while I think he’s an excellent candidate for the kind of contract you’re talking about, one that buys his first couple years of free agency (to age 30), the question I have is how much do the Reds sacrifice if they wait a year or two to do it. I’d say in a year they’ll have a better sense of whether Mahle does round into the kind of pitcher we think he’ll be. But his essentially skipping AAA makes his development a little more of a risk. Steve, I agree that now is too soon. Mahle has shown some promising moments, but I’d want to see if it is something he can maintain and improve upon before guaranteeing $30 million or thereabouts. The premise of locking up players early is one that many teams, including the Rays, have tried. The Indians have done this, though not quite as early in players’ careers. Thanks for the kind words Steve! I hadn’t thought of doing a retrospective on contracts, but now that you mention it, that might not be a bad idea! The problem with waiting is that the only reason you’d be willing to sign Mahle to this kind of extension is because you whole-heartedly think he’s going to be good. If that’s the case, in one or two years, that price is driven up substantially. Imagine what Chris Archer would make on the open market right now… a whole lot more than he actually is. I’d rather make the mistake of signing a guy too early than signing a guy too late. If he does flame out, you’d be paying way more down the line than you would if you took a chance on him before fully proving himself. It’s a sweet spot I’m trying to find with this series. Looking back on some of the contracts I’ve used for comparison (especially those signed by Tampa), I’d say history agrees with me. I’m talking about waiting one year, not three. If they end up paying a little more (and I doubt it would be much more) that’s worth the greater certainty. I don’t think the Reds could whole-heartedly think he’s going to be good right now. Maybe the odds are on that side, but not nearly as certain enough as need be. Wait another year. Signing a player long term is good and bad, if he produces good, if not bad. If contracts could be written with base salary and incentives it would be great, if you could get the player to agree. I think most people in the real world get paid on how well they do their job, in the players case in long term contracts they get paid even if they don’t perform. I’ve gotta disagree here. In the real world, people get paid according to how they negotiate before being hired. They may get a raise depending on their performance, but when’s the last time you heard of someone taking a paycut due to performance? It doesn’t happen. The fact is, you can’t sign someone to a contract at the end – by definition, you have to do it up front. No team who’s ever signed a contract has known what they’re going to get over the span of the terms. You take a gamble on guys you see growth and maturity in. Some people take gambles on guys that don’t show growth or maturity. It’s that second one the Reds can’t afford to do. I like Mahle a lot but I would not extend him for at least another year. He needs to.prove he can avoid the long ball at gabp, pitch 185-200 innings, get to the 7th inning with regularly and cut his BB %. The reds also need more time to make sure he stays injury free. Same for Castillo. The Bailey contract needs to be closer to expiration before any more long term deals are made. If Disco does the rest of 2018 what he did in 2016, then he should be a focus as well. I’m for it. Mahle is the closest thing to a sure thing MLB contributor for the future that the Reds have. I would say he has the highest floor, even if his ceiling is a mid rotation starter. I can see him being a #3 or #4 starter on the next good Reds team. DO IT. I feel like the $/WAR scale only works for players in the 3-4 WAR range. Would I pay $6-8M/Year for a 1WAR free agent? (I understand this works differently for relief pitchers, but paying that for 1 war SP or position player would be crazy.) No, just call up AAA player. Would anyone actually pay $60-80M/year for Trout? Maybe the Yankees, on a short deal, but if they signed him to 8 year deal theyÃ¢â‚¬â„¢d be in salary tax hell for a long time. Andy – you make a very good point here, and it’s not one I’ve seen noted anywhere else. Using any metric involving ‘average’, especially without any standard deviation attached to it, is very sloppy and is vulnerable to skew, dispersion and applicability issues, the latter two you noted. The $/WAR average is nearly ubiquitous on sites like ours but is quite flawed at its extremes. It is quite literally, an average, of an average, determined retrospectively. Ugly indeed. Great article, and great post. Jordan, I don’t know what you but not everyone gets to negotiate their pay. As far as not get a pay cut on performance consider a salesman who works on commission. I worked for a company who’s salesmen didn’t perform and the whole office staff got a 25 percent pay cut. No way. Not yet. Let’s let him get through the league a while. Last year, one can easily argue he was pitching against AAAA talent in the majors, since the main clubs would have been the only ones playing their regular starters regularly. So, this is the first time he’s seen real major leaguers each time out. Nope, wait till after the season, at minimum. I would wait till the middle of next season. If he has success, if he improves even more, then extend him. Till Then, no reason to.